If you happened to be walking around downtown Bozeman Thursday evening, it may have sounded like some of the local wildlife wandered too close to town! 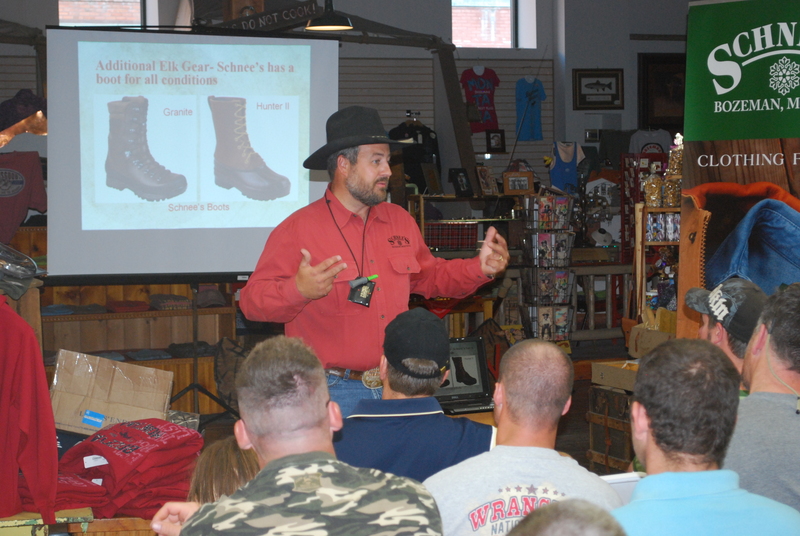 Chad Schearer, host of Shoot Straight TV and multi-award winning elk caller, was filling the air with chirps, mews and bugles while passing along some important calling tips to the crowd during a great elk calling presentation Thursday at Schnee’s Powder Horn Outfitters. Nearly 50 guests crowded around as Chad covered some key points on calling and how to become more successful at calling in the field. 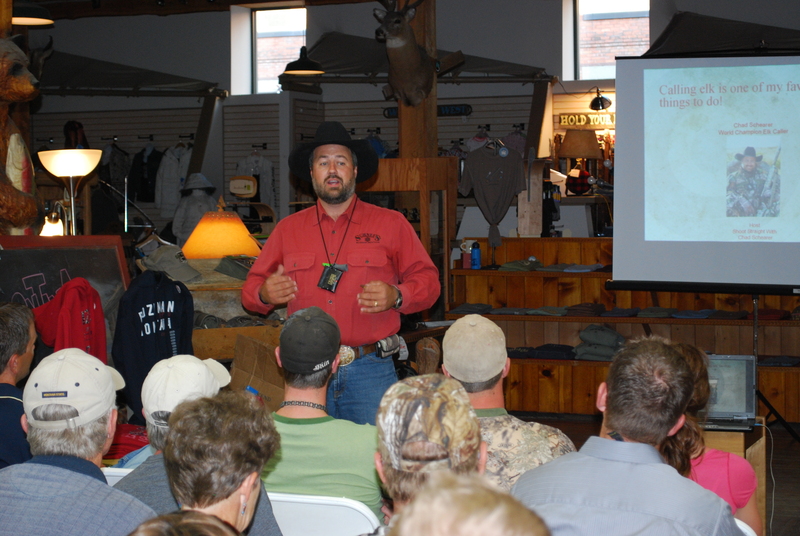 With over 20 years of experience calling and guiding hunters in the woods, Chad elaborated on how and when to use calling to your advantage in different types of hunting scenarios. One practice in particular that Chad stressed the importance of was that of “aggressive patience”. According to Chad, this means “patiently waiting until the time is right is to be aggressive”, learning to be aggressively patient is a valuable tool for anyone that would like to become more successful during the elk season. During the seminar Chad did a great job of answering questions and he even hung around afterwards to help those who had even more questions about specific types of calls and gear for the hunt. 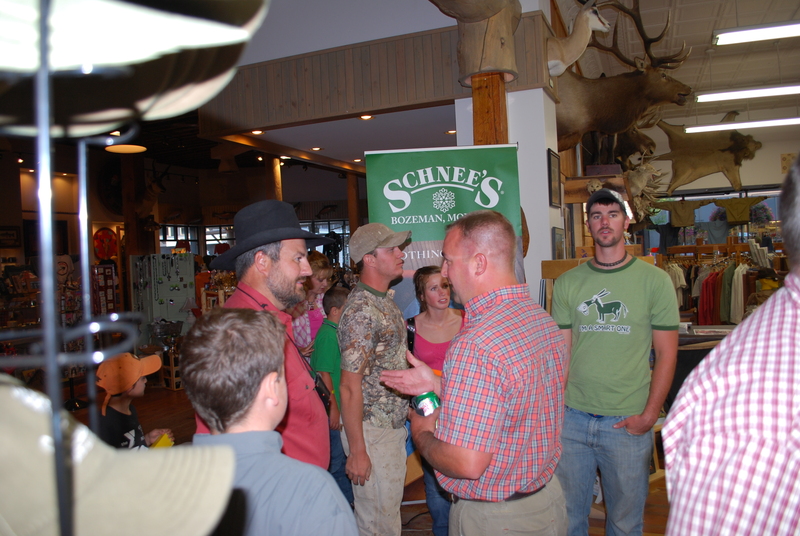 Chad, his wife Marsha and there two boys are very passionate about hunting and the outdoors as well as preserving the outdoor heritage. If you would like to see more of Chad and his family and continue to pick up his tips, tune into The Sportsman Channel 9PM MST Tuesday, 6AM MST Friday or 4:30PM MST Sunday afternoon for Shoot Straight with Chad Schearer. Thank you to all that attended this fun and informative event and thank you to Chad and his family for coming down and putting on a great show!